It is my hope that one day "Darswed Teckels" will be the site for all your Teckels needs, from help and advice, to buying all the equipment you may need for your dog in the home and field. Working Teckels are far removed from the show type we see in the UK, and Darswed Teckels originate from a top working Kennel in Denmark with breeding lines from France and Germany , all breeding to Fédération Cynologique Internationale (FCI) standards with an emphasis on working dogs yet still maintaining outstanding show standards and results. We use our Teckels for for Roe, Red and Sika stalking , in Northumberland and Scotland. 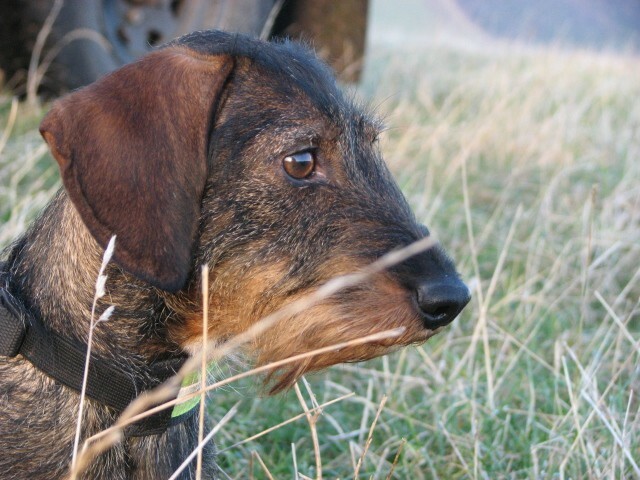 Our aim is to breed Working Teckels with excellent tracking ability's, good temperaments and good type. We are breeding both " hairy wires" and "smooth" wires . Both wire coats ,see coat types . We are now confident in saying we have some of the best working Teckels in the UK , and our imported Danish and German dogs should prove an invaluable asset to the future growth of working gene pool of UK Teckels. And at Darswed Teckels when we say we work our dogs, we mean it ! Welcome to my site on working Teckels, this site contains information about deer stalking and working dogs in various hunting pursuits, and contains articles and images relating to this. I have tried to keep all images of dead deer within well labeled pages so as not to offend any one. Deer stalking and vermin control is a necessary part of countryside management, and the use of dogs to hunt, find dead or wounded animals goes hand in hand with this. If you find this subject upsetting or offensive I suggest this site is best left to others to view.